Beginning in World War II with the first research and fabrication of nuclear weapons in Los Alamos for the Manhattan Project and the first atomic bomb test at the Trinity site near Alamogordo, New Mexico’s story is linked with the history of nuclear science and innovation. 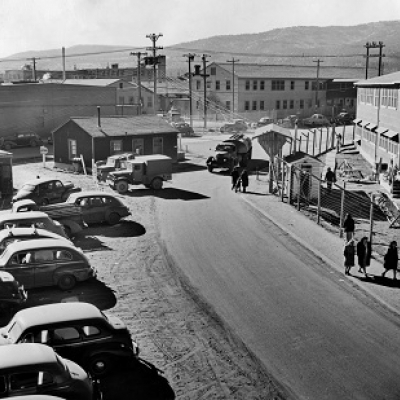 As soon as the war was over and the Cold War began, two national laboratories were founded in Los Alamos and Albuquerque that advanced the technologies of war and later, would pioneer cutting edge physics, chemistry and other scientific fields. Mines in the Grants Mineral Belt were opened in the western part of the state that unearthed the fuel for both weapons and new sources of energy. Eventually, the state was chosen to be the site of disposal for nuclear waste byproducts at the Waste Isolation Pilot Project in Carlsbad. A new uranium enrichment plant has opened in Eunice. Old projects ended, and new challenges would emerge, but in the 21st century, New Mexico is at the forefront of our nation’s nuclear scientific endeavors. This exhibit explores the most famous events, sometimes little known stories, and inventions have been born here which impact our lives, and helps to recognize the remarkable contributions of thousands of people that have been involved in writing New Mexico’s Atomic Histories for the last 75 years. Photo courtesy of the Los Alamos Historical Society Archives .